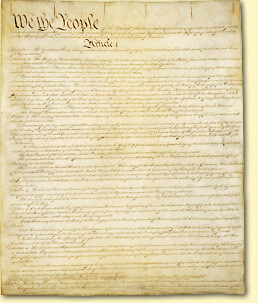 For the full text of the U.S. Constitution, see Full Text of the United States Constitution. For a course on Government and the Constitution, see List of Courses. The United States Constitution is the supreme legal text that forms the framework of the United States government. It was written by the Constitutional Convention of 1787 which debated many plans and compromises. The existing Congress sent it to the 13 states; after heated debates all 13 states ratified it in 1788 and it started in operation in 1789, with George Washington the first president, as the first Congress met in New York City. Reproduction of painting of George Washington, Benjamin Franklin and others signing the U.S. Constitution in Philadelphia, Pennsylvania by Henry Hintermeister. It superseded the Articles of Confederation. Constitution Day is celebrated on September 17th, and all public schools are required to devote attention to it that day. The U.S. Constitution was prepared in secret, behind locked doors so that outside interests could not interfere. Historians believe that the delegates did keep absolute secrecy. Some of the original framers and many delegates in the state ratifying conventions were troubled that the original Constitution lacked a guarantee of individual rights to protect them against the federal government. Supporters promised such a "bill of rights" and in 1791 the first ten amendments were ratified and became known as "The Bill of Rights". After the Civil War, the Constitution was amended to prevent state governments from infringing on the rights of the people. The Constitution of the United States of America specifies the laws by which The United States government is allowed to govern, included among these are the Freedom of Religion, Freedom of The Press, Freedom of Speech, and the right of habeas corpus (Amendment XIV). It also, helps to guarantee the rights of the minorities by rule of law, such as African Americans and other minority groups, and to guarantee religious freedoms. It also defines a system of checks and balances by establishing three separate but equal branches of government (Legislative, Judicial and Executive), and lists the of powers not specified in The Constitution are reserved to the states and to the people. It also established a representative republic form of government, by the consent of the governed. The US Constitution contains seven articles, followed by twenty-seven amendments. Click the Article names to read a full description of each article. Article I pertains to Congress. Article II pertains to the presidency. Article III pertains to the Judicial branch of government. Article IV addresses relations between the states of the United States. Article V details the process for amending the Constitution. Article VI establishes the Constitution, law passed by Congress, and treaties entered by the United States as the supreme law of the land. Article VII explains the Constitution's ratification. This page was last modified on 30 August 2014, at 19:23. This page has been accessed 111,404 times.